While you may save a decent amount of money on the purchase, buying a home from a smoker may seem risky if you’re not a smoker yourself. Cigarette smoke permeates surfaces and fabrics, leaving a smell to linger long after cigarettes are no longer being smoked in the area. Fortunately, there are many things you can do to eliminate a smoky smell from your new home. Fabrics and carpets absorb smells more than hard surfaces. Much of the smell of smoke should vacate the property as soon as the former owners have removed their clothing, blankets and upholstered furniture. However, if carpet is left in the home, this will almost certainly need to be attended to. Carpet is easy to tear out, but removal can be time consuming. To start, lift up the edge of the carpet in any room and pull it back to reveal the padding and tack strip beneath. Carpet tears easily, so you can rip it out in easily managed strips. Once this is done, use a pry bar and needle nose pliers to pull out the nails and tack strip left in the floor. For an option that does not involve getting new flooring, try sprinkling baking soda over the carpet and leaving it there overnight. Vacuum it all up and repeat as necessary. 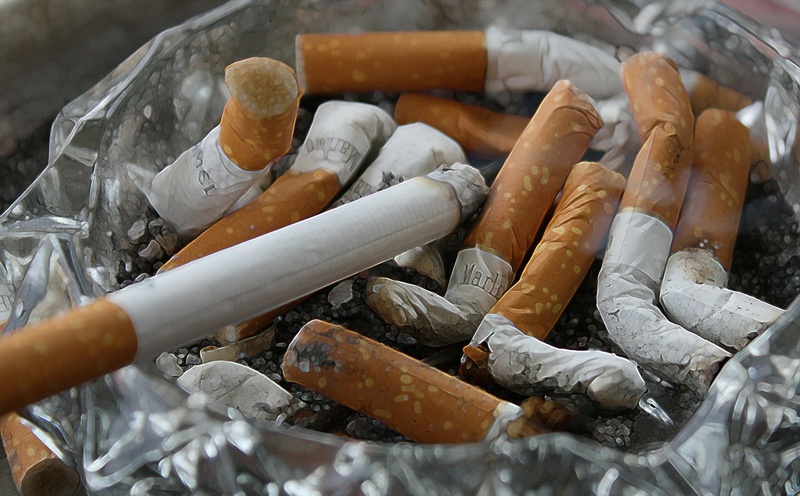 Cigarette smoke can leave a greasy yellow film on walls and other surfaces. Use a degreaser to wipe down all walls of your home – once this is done, repaint the walls with odor-blocking primer and a fresh coat of paint. This will help cover up old smells and will also get rid of any yellowing that may have occurred because of the regular exposure to smoke. Another benefit of repainting right after buying is that it will be much easier to do before you have moved everything in. Many buyers have an ideal color in mind, but forget about making any changes until after everything is settled. All air in the home passes through the HVAC system air filter, located in a slot between the furnace and the blower. Over time, this air filter will absorb smells from elsewhere in the home. To change the air filter, turn off the HVAC system, then pull the filter out of its slot. Take the filter to a hardware store or home improvement store to find a replacement. When you’ve bought a new filter, insert it into the slot. When you’re finished, turn on the HVAC system. Air ducts have a way of collecting dust. This layer of dust is redistributed throughout the house when the HVAC system runs, which can spread the smell of smoke throughout the house each time the furnace or air conditioner kicks on. Cleaning out your air ducts at the same time that you replace the air filter will help ensure that your HVAC system distributes fresh air through your home every time the it turns on. If you’re very sensitive to smells, you may find that a professional cleaning service may be necessary to remove the smell from your home. After trying everything else, contact a cleaning service in your area for help. When negotiating with sellers, remember that you may be able to get them to pay for such a service before moving in. For more ideas, make sure to communicate with your real estate agent. Homes that have been smoked in usually take longer to sell, so if you are willing to put in some extra work upon moving in, you may be able to snag a deal on a property that may otherwise be too expensive.